WildEepz Transparent Silicone Display Cushions for PowerBook G4s and Dual-USB iBook. 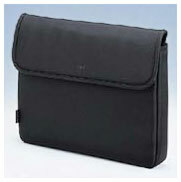 For notebook users or students on the go - the ResQMobile 7-Pocket Bag Pack easily converts from backpack to briefcase. Made of a durable red nylon, it features seven versatile compartments. Carry a notebook computer, books, documents, CDs, keys, wallet, a toothbrush, or anything else needed! As a bonus, the Bag Pack comes with a Deluxe Day Planner, which includes an address book, project pages, solar powered calculator, pens, and a mechanical pencil. SimpleTech, Inc. has announced the immediate availability of its complete line of portable 7200 RPM notebook hard drives and external drive upgrades, offering a true desktop replacement for mobile users. Corporate mobile users, video editors, multimedia professionals, and graphic artists require high-speed hard disks that offer rotation speeds greater than 5400 RPM, which until now, could only be found on the desktop. The portable notebook hard drive upgrades deliver desktop performance, with 60 GB capacity and the only available 7200 RPM 2.5" system- specific hard drive, enabling corporate mobile users to work with the same computer while in the office or on the road. SimpleTech's notebook hard drive upgrades meet or exceed OEM system specifications, ensuring fast and easy installation, and guaranteeing 100 percent compatibility. The SimpleDrive D7200 USB 2.0/FireWire 7200 RPM external drive delivers the fastest speed currently available in a portable external hard drive, and is compatible with any desktop or laptop computer with a USB or FireWire port. The rugged D7200 is ideal for video editing, multimedia storage, and mobile backup, offering a non-operational shock rating of 1000 Gs, 60 GB capacity, and up to 480 Mb/sec. data transfer rate. SimpleTech's StorageSync backup software for Windows is included, providing quick and easy backup, restore and synchronization for an entire PC, or selected files and folders. SRP for the notebook hard drive upgrade is $499.99 and SRP for the SimpleDrive D7200 external drive is $399.99. WildEepz Display Cushion Upgrade provides a solid, stable, and insulated display to chassis interface for your PowerBook G4 or iBook when latched. Uniform display-to-top case clearance is maintained by these transparent, low-tension silicone cushions. These nearly invisible and non-reflective spring-like pads effectively prevent the display bezel from contacting the case and aid in maintaining a gap between the screen and lower chassis. The cushions are easily applied to the display bezel. Finish abrasion is completely eliminated, as well as screen abrasion in all but the most severe use. WildEepz are backed with an advanced aerospace adhesive that stays put, yet allows them to be easily removed without finish damage. 'Books fitted with WildEepz exhibit a very rigid feel that can only be described as "awesome." An installation template is included for quick and perfect placement of the cushions. Includes 10 per set, more than enough to totally outfit one PowerBook or iBook. Series 1 fits the 15.2" titanium PowerBook. Series 2 fits all aluminum PowerBooks and Dual-USB iBooks. Transparent silicone is virtually invisible. No more "PowerBook G4" decal transfer to top case. Eliminates stress on hinges and latch mechanism. 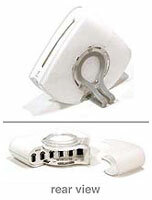 Reduces or eliminates unintentional unlatching when handling, since latch tension is optimized. Cleans up lines on PowerBook and iBook. Blueprint perfect! Advanced adhesive stays put. Removes easily without harming finish. Eliminates the need for a sheet-style screen protector in all but the most extreme circumstances. It is often handy to be able to toss a PowerBook into a large backpack, briefcase, or suitcase. With the dust and grime that accumulates in these kinds of carrying cases, however, extra protection is essential. Putting your TiBook in the specially designed Shinza TiBook Sleeve before heading out will protect your computer from the everyday grime that accumulates in larger bags and backpacks. It also features two convenient CD-sized pockets on the back of the case. A perfectly snug fit with the PowerBook Titanium G4, this lightweight slipcase also fits other large screen notebooks - up to 15.1 inches diagonal - with thin profiles of less than 1.4"/35mm in thickness. Extra padding on all sides of the notebook provide protection against shock and scratch damage. These are brand new 9 mm, 2.5" IDE Hard Disk drives. They'll fit all the PowerBooks from the 5300/190 and newer. Fully ATA-5 compliant. You can check it out at Wegener Media. "The much anticipated 7200 rpm notebook drive from Hitachi is shipping. Is it really faster than the 5400 rpm and 4200 rpm notebook drives? And how does it compare to a fast 7200 RPM 3.5 inch drive?" Find out at Bare Feats. Adding six FireWire ports to your computer couldn't be easier. The Belkin 6-Port FireWire Hub stands vertically on your desktop, conserving precious desktop space as it saves you from reaching behind your computer for ports. Simply plug your high-speed, Zip, optical, or disk drive, scanner, printer, and other peripherals into the five rear hub ports; a sixth port is conveniently located up front for easy access for your digital camera or other portable peripherals. The unit stands alone or docks with additional Hubs, making it easy to put all your multimedia gear on the ultrafast FireWire track. FireWire technology supports up to 63 devices on one computer with Plug-and-Play ease. The Belkin 6-Port FireWire Hub's sculpted, breakthrough design is aesthetically pleasing as it is functional. Intrinsic cable management flows your cables from the hub in single file arc, reducing desktop clutter. Digital Peripheral Solutions Inc. (DPS) has announced it is shipping its new Que! 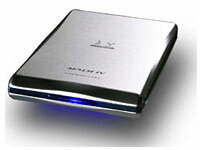 DVD 2i dual format dual interface drive with direct-to-disk recording (DDR). The external DVD burner offers IEEE-1394 (FireWire) and USB 2.0 interfaces and supports DVD+RW, DVD-RW, DVD+R, DVD-R, CD-R and CD-RW formats for PC and Macintosh. As a result, buyers never have to worry whether or not they're purchasing the right burner because the disks they create can be played on virtually every DVD video player and drive. The Que! DVD 2i with DDR enables anyone using a digital camera or camcorder to record directly to DVD media in real-time without saving images onto the computer hard disk drive. This innovation in DVD authoring software eliminates the need to transfer video from the camcorder to the hard disk then to the burner. The Que! DVD 2i makes it easy for anyone to produce high-quality DVD videos, photos and audio files as well as data backup and storage. It delivers write speeds of 4x for DVD+R and -R, 2x for DVD-RW, 2.4x for DVD+RW, 16x for CD-R and 10x for CD-RW. In addition, the drive comes bundled with software for PC and Mac, all cables and a universal power supply. It weighs only 3.6 lbs. FirewireDirect.com, Inc has announced the introduction of their newest series of 2.5" hard drive based storage devices, the MachIV. The MachIV boasts the most current FireWire and USB2 components in a small and sleek titanium-style form factor only half an inch thick. The MachIV employs premium mechanisms and boasts the latest edition of the speedy Oxford 911 FireWire chipset. It has one 1394a port and a high speed USB 2.0 (backwards compatible with USB 1.1). The MachIV ships with FireWire and USB cables, a full range (110-240V) power supply and includes a stylish and compact carrying case. Available as a finished product with capacities from 20 to a massive 80 GB of storage or as an enclosure kit, the MachIV provides a wide range of solutions for the discerning user. Those ordering for Mac will receive the SpeedTools Utility Suite which includes DeviceTuner, Disk Defrag, Integrity, QuickBack and QuickBench. MacMice has announced its GPerch anodized aluminum desk stand for Apple iPods. Billed by MacMice as, "The World's Fastest iPod Stand," the GPerch is specifically styled and constructed to complement the appearance of Apple's new G5 Power Mac. Its outer frame is CNC laser cut to the same "handle" profile as the G5; and, the perforated aluminum cradle that holds the iPod is CNC punch perforated to match the front grille of the new Apple tower. The GPerch uses the same 5052 grade aluminum sheet, and the same microplasmic anodized surface finish as Apple's G5 case and the case of the new iSight web cam, and it accommodates all iPods, all iPod accessories, and all iPod cases. The GPerch will start shipping on July 15th and is available for preorder now for US$39.99. Phone orders at 1-877-686-4835 - mention value code "MWNY".